While AUM is an extremely versatile app, musicians accustomed to the edit window layout of traditional DAWs may find that AUM’s record function isn’t quite as straightforward as it might at initially seem. Although AUM can host AUv3 and Inter-App Audio apps and is capable of recording, it isn’t technically a DAW like GarageBand, Cubasis or BeatMaker 3. You don’t have an edit window and you can’t create complex multi-track recordings. Instead, anything that you do record is immediately saved as a .WAV file, but it’s not immediately obvious where your recorded audio files can actually be found. Pressing the play button won’t play back your recorded audio, instead, you’ll have to go into the files section in the menu of AUM. But what about editing the audio? Well, AUM itself doesn’t actually have audio editing functions so the best way to edit your recordings is to use AudioShare. 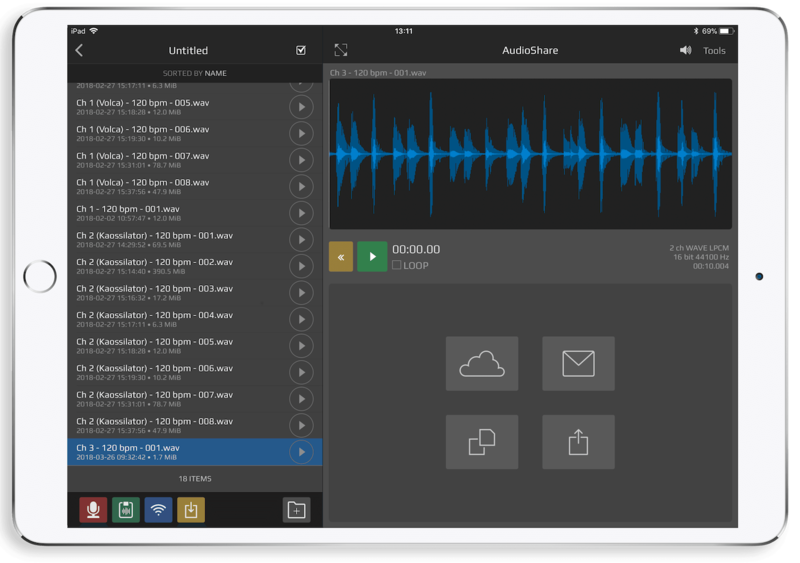 Audioshare is another Kymatica app that pre-dates AUM and serves as an audio file manager, which is essential for almost any mobile musician considering that iOS devices don’t have a built in way of organising audio files. On top of this, Audioshare has some extremely useful editing tools, so you’re able to trim your audio files before loading them into another DAW. Although Audioshare is a must have app for any iOS producer, it’s particularly useful for AUM users, as anything that you record is automatically available within AUM, which can be invaluable if you want to record something in AUM, then trim the audio and create a loop from it that you load back into AUM using the file manager. If you already have Audioshare, all you need to do is go into files in AUM and tap the ‘Manage recordings in AudioShare’ button at the bottom of the page and you’ll be taken into Audioshare where you can edit your AUM creations. If you’re interested in learning more about AUM then sign up to our free AUM masterclass series to super-charge your skills.